The first thing I pulled out was this Kalusian Sunset candle from Happy Piranha – It is amazing that FairyLoot is including full size candles, but doubly amazing that they are naming them and incorporating them into the featured book of the month. That is so cool to me! This candle smells like strawberries and champagne, and its yummy. A single full size candle on Happy Piranha’s Etsy store is $10.34. Next up is this cupcake bath bomb – Since bath bombs are one of my new favorite obsessions, I was super stoked to see one included in this box! I loved the color, but since I have already used it, I can personally say that I wasn’t a huge fan. The scent was a bit too sweet for me; basically it smelled like I was taking a bath in cupcake batter. These specific bath bombs retail for about $3.36 from Bathing Beauties UK. How about this pouch with a Rebel of the Sands quote on it? – I love getting pouches from subscription boxes, they are so much fun and actually really useful! The quote on this one is really pretty, I love the ombre lettering, although I will confess I found the quote chosen to be a little bizarre. To me, it doesn’t make any sense. I am actually having a hard time pricing this because I don’t think it is as high of quality as the pouches you could get on Society6 (those are listed for $14 for the smallest size), but I can’t find any other reference point. So I am going to make an educated guess of $9 retail value for the pouch/coin purse (five dollars cheaper than the nicer pouches I could find). I cannot get over this Dancing Baby Groot Funko key chain – it is one of my favorite items! I know it’s so simple, but I love Guardians of the Galaxy and this was such a cute addition to this box. These key chains retail for about $5. I cannot stop staring at this double-sided print of Manon & Dorian! – This is another really hard item to price, but I don’t particularly care because it is amazing! I love Manon, she is probably my favorite character from the Throne of Glass series, and Taratjah’s art is stunning. I actually spent way more time on her website than I meant to earlier today! This is also an exclusive item for FairyLoot this month, and while it’s not printed on the sturdiest of paper, it is thick enough to frame without looking cheap. I love it so much, but I can’t price it, I’m sorry! The Space Girl book mark from Till & Dill – I know I said that Baby Groot was one of my favorite things in the box, well this bookmark actually WAS my favorite item. It is so completely gorgeous, the details are amazing, it was exclusive to FairyLoot, AND each bookmark was lovingly wrapped in tissue paper and ribbon. The care these ladies put into their bookmarks astounds me. I am in awe. A single bookmark retails for $2.20 in their Etsy store, but lets bump the price up to $3 for the exclusivity! Illuminae coaster – I don’t have near enough Illuminae merchandise, and for a book that I adore, that is a damn shame! This coaster was designed by @aaentereads / Read at Midnight, and its awesome. Again, a hard item to assign a value to, but I would gladly pay $5 for it! Finally, the book! 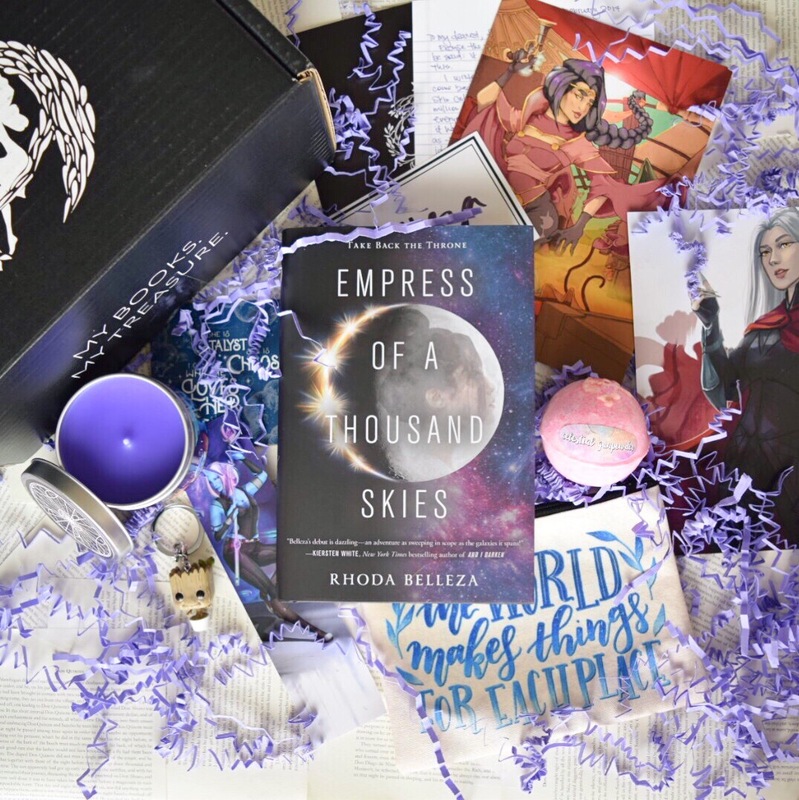 Empress of a Thousand Skies by Rhoda Belleza – I had been wanting this book actually! It has been on my “watch list” so to say, for a few months, and I was super excited to see it in the box. I’ve actually already read it, and my review is HERE if you want to check it out (spoiler alert: not a fan) but that doesn’t mean it wasn’t a great pick for the February box! You can find this book on Amazon for $10 so even though that is less than the listed price of the book, that’s what were going to go with here. I paid 50 dollars for this box, which includes the international shipping costs, and overall the February Emperors & Fugitives box had a retail value of about $45 (not including the Manon/Dorian print that I couldn’t put a value to)! There were also a few bonus items, like the signed book-plate, the letter from the author, a coupon for 30% off to mybookmark.com, and a sampler of a new book coming out. This isn’t the highest value FairyLoot I’ve gotten, but it’s still probably my favorite. Keep doing your thing FairyLoot, you rock. Previous postEmpress of a Thousand Skies – more like a thousand whats?! All the purple 😍😍 Gorgeous! i know purple is my fave!